I think when Wayne's World came out in 1992 it was pretty much everyone's favorite movie at the time. I know it was mine. 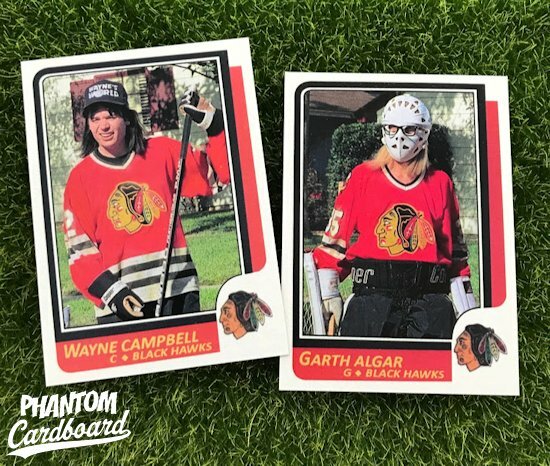 These Wayne and Garth cards are a couple that I probably should have made quite awhile ago. Better late than never. For these I chose to make them in the 1986 Topps style design for a couple of reasons. For one, I already had it ready to go having first used it for my Cameron Frye card. The other reason is that the 1992 Topps hockey is kind of blah. In '92 Topps used the same basic design for all four major sports. Plus, I wanted these to have a more vintage feel. Although I'm not a huge hockey guy, I do really like the Blackhawks logo so I wanted a design that called for a logo. I think it's one of the best looking logos in sports, all political correctness aside. *You may notice that the name team name Blackhawks is two separate words which is how it was spelled until 1986.